CD180 is a type 1 membrane protein consisting of extracellular leucinerich repeats (LRR) and a short cytoplasmic tail. It regulates B cell recognition of lipopolysaccharide. The extracellular LRR is associated with a molecule called MD-1 and forms the cell surface receptor complex RP105/MD-1. It belongs to the family of pathogen receptors, Toll-like receptors (TLR). RP105/MD-1, working in concert with TLR4, controls B cell recognition and signaling of lipopolysaccharide (LPS), a membrane of constituent of Gram-negative bacteria. The extracellular domain of CD180 contains 22 LRR, tandem repeats of leucine-rich motif (LMR). This LMR is a 24-28 amino acid sequence in which leucines are characteristically positioned. The ligation of CD180 on B cells by a monoclonal antibody induces activation that leads to upregulation of costimultory molecules, CD80 and CD86, and an increased cell size. CD180 is expressed on mantle zone B cells and marginal zone B cells, but weakly or negative on germinal center B cells. 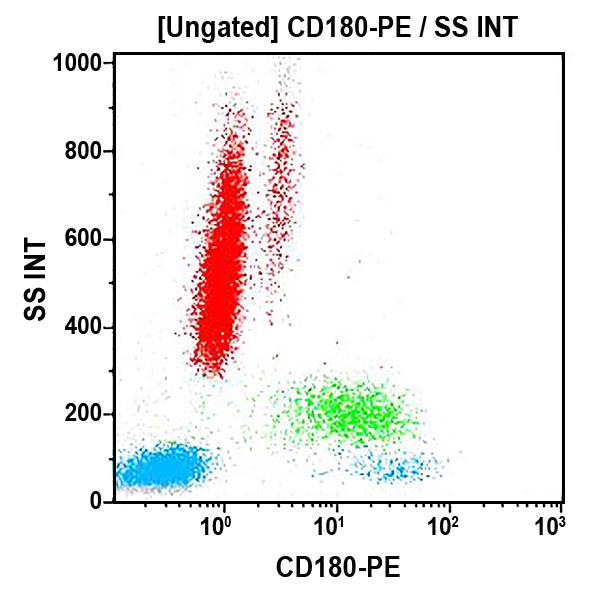 CD180 is also expressed on peripheral blood monocytes and dendritic cells. Clone Description The monoclonal antibody MHR73-11 was generated against human RP105 complexed with mouse MD-1 and recognizes the CD180 protein.